← How can I change the printer tray to print PDF via a command line? 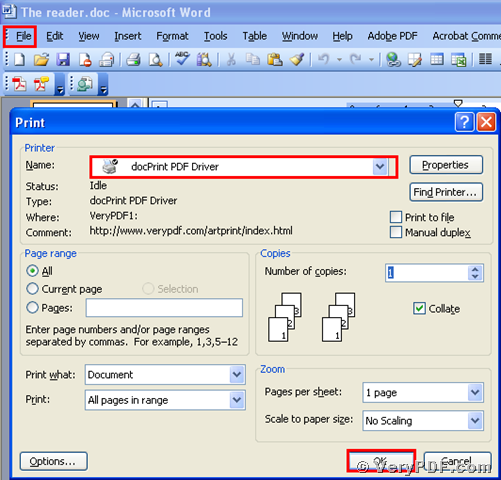 Do you want to know how to print Word to pdf? Today I am going to illustrate how to print Word to pdf. So Which software can be used in this process ? Do you know it? Here I will recommend the docPrint Document Converter to you. 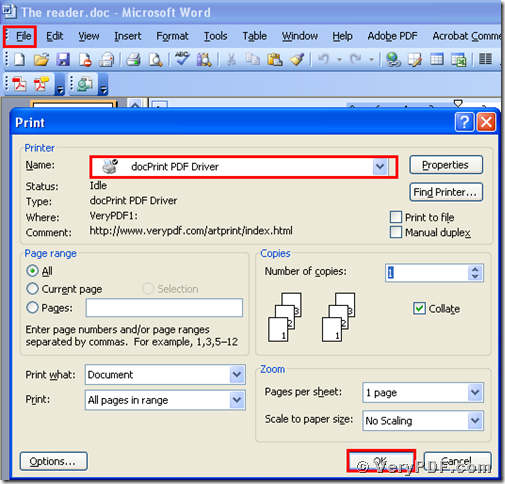 This software have a virtual docPrint PDF Driver, which can print Word to pdf. If you want to know more this driver, just visit: http://www.verypdf.com/artprint/image/index.html. You can not believe that it will take no more than tree minutes to print Word to pdf. Do you want to try it? Let’s follow me. after finished installing , there will appear an icon in your desktop. There are two choices for you: you can use the trial version , it is free; Or you can register it. Whatever, it depends on you. Second, open your file ( The reader.doc), and click “File” – find “Print”-click “Print”. Then it will pop up the dialogue “Print”, you just need to choose the virtual print “ docPrint PDF Driver”, and click the button “ok”. Please look at picture 1. Third, save the changed file in your computer. Then Separately open the before changing and after changing files , you will obviously find that we had printed Word to pdf. Here I also give you two screenshots to show you. It is very easy to operate, isn’t? You can experience by yourself and enjoy it. It can not only save your time , but also can save your energy in your daily work. If you think this software is useful, remember to share the docPrint Document Converter to your friends. Thanks for your reading. This entry was posted in docPrint Pro and tagged docPrint, document converter, word to pdf. Bookmark the permalink.